There's a first for this blog - vinyl haiku. I was looking for ways to describe this mix and as I collected expressive words, the list started to take on it's own poetic quality. So I thought, what the heck, I'll just formalize it into an actual haiku. It was fun, I haven't written any sort of silly haiku in years. Anyway, the haiku fits this mix because the music is all dusty and scratchy. It all has a old vinyl feel to it. It some cases it has that feel because the music really is old, like early 1900s old. Two of the tracks are actually old Edison cylinder recordings. I searched through old recordings at archive.org for music that would blend well with the other ambient & neo-classical tracks in this mix. I've done two previous mixes in this style - Sustain & Decay and Revenants of the Past. A lot of ambient music makes use of noise, distortion, scratches, glitches, hiss & pops so the actual old recordings fit in nicely. There are six old recordings that appear in the final mix. Most of the ambient cuts are of fairly recent vintage. I like the title for this mix because the word "score" takes on a double meaning as in a musical soundtrack as well as trench, channel or groove in a vinyl record or cylinder. Enjoy the pops & hisses. One of my favorite mixes from last year was Sustain & Decay. It was fun digging up old recordings & mixing them with new releases. 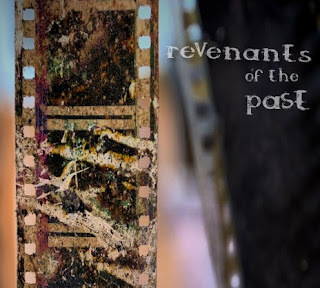 So I decided to do a follow-up, with the result being "revenants of the past". It follows the same basic formula of last years mix(which was also released in October). I browsed through a ton of files at archive.org, looking for things like old vinyl records & Edison cylinder recordings from as far back as 1888. I mixed these recordings with current music that either sounds old or in some cases actually uses old recordings as a sound source to be manipulated into something new. In the last mix The Caretaker figured prominently and here too there is an extended track in the middle of this sequel mix. The track is an excerpt from a mix James Leyland Kirby, AKA The Caretaker, did for Fact Magazine. I think "revenants" is a good mix of familiar & unfamiliar artists here. I had to get William Basinksi's Disintegration Loops in somewhere & so the mix closes with a track from Loops #2. The idea for this mix came from frequent low light mixes downloader/listener, Ron Sylvester. He told me about some mixtape cd's he had done, all of which are fantastic & intriguing. One idea in particular interested me. Ron download some recordings of old 78rpm records from archive.org. The thought of old, scratchy opera recordings was too much to resist. So that's where this mix started. I had intended it to be similar to my shortwave mixes but it didn't exactly end up that way. Part of the reason is my own impatience, I wanted to get a new mix posted but didn't want to take weeks to sort through the tons of possibilities presented by archive.org & other sites. So I collected some pieces, ripped off several other tracks from some of Ron's various mixtapes and grabbed some newly purchased & downloaded music and set off to mix it up. I found the perfect compliment to the old 78's is music from The Caretaker. His music was inspired by the ballroom scene from "The Shining". From the Caretaker website..."The first release played and extended this theme of altering 1920's and 1930's ballroom music creating an eerie and haunted soundworld. Subsequently the sound has become darker and often more abstract over time, moving away from the initial idea of a haunted ballroom into territories involving the mind and its abilities to recall memories." You can download some of the full albums here...Caretaker Releases. I have 3 Caretaker tracks in the mix which is more of one artist than I usually put in one mix but I think these cuts work very well. The mix sort veers away from the old & scratchy theme about two-thirds of the way through. It just sort of morphed on it's own as I pulled tracks. Mixes can be funny that way, developing their own path. I'd like to thank Ron for the ideas & for the tunes in his mixtapes that I ripped off for this mix.